Liability car insurance pays for damage you cause to other people and others’ property in an accident. But if you don’t have enough coverage, a lawsuit judgment could force you to hand over everything — including your nest egg for those golden years. So how do you protect your retirement savings? Nathan Mahlik, owner of a State Farm agency in Danville, California, tells his clients that they can either have sufficient liability coverage or risk their future wages and assets. The Employee Retirement Income Security Act keeps creditors from getting their hands on certain “qualified plans,” including pensions and 401(k)s. But IRAs and some other types of retirement plans do not have the same federal protection. Traditional IRAs are protected from creditors to some extent in all 50 states and the District of Columbia. Some states give full protection to IRAs and Roth IRAs, but in California and Georgia, for example, part of an IRA may be withdrawn to satisfy a judgment as long as enough is left to support the owner’s household. This “reasonably necessary” amount is determined on a case-by-case basis. Roth IRAs are not protected in eight states: Alabama, California, Georgia, Hawaii, Idaho, Indiana, West Virginia and Wyoming. Money that has been withdrawn from a retirement account generally is not protected from creditors. In some cases, retirement assets may be protected at least partially if you declare bankruptcy, though that would be a last-ditch move. The state-required minimum for auto insurance is often insufficient to cover all judgments. In Florida, for example, the state’s insurance minimums are $20,000 for injuries and $10,000 for property damage. Amounts like that can be quickly exhausted. According to Jury Verdict Research, the median vehicular liability jury award was $34,877 in 2013. But there were enough larger awards to push the average award up to $351,829. Compare car insurance quotes through NerdWallet’s car insurance comparison tool. Lowballing your liability coverage is a mistake, since you and possibly your estate are responsible for paying whatever damages it doesn’t cover. To resolve your debt, a court might look at the sale of your assets, garnishing your wages, taking your savings and possibly tapping your IRA if your state law allows for this. In other words, you might lose everything you have, plus a portion of your future earnings, retirement savings or both. It’s a good idea to carry liability coverage for an amount greater than your net worth. Doing this would help protect your retirement savings in the event of a large judgment against you. Insurance companies place limits on the amount of car insurance you can buy. A typical limit is $500,000 each for injuries and property damage. But it’s possible to purchase an umbrella policy, which adds extra liability coverage to your auto and home policies; it starts paying out after regular coverage has been exhausted. Mahlik estimates that at least 70% of his customers have umbrella coverage. It’s relatively inexpensive. A $1 million umbrella policy can cost $150 to $300 a year, according to the Insurance Information Institute. Say your liability policy tapped out at $250,000 and your net worth was $500,000. You could sell everything you own and still fall well short of a $1 million judgment. That could leave you vulnerable to wage garnishing and a lifetime of financial struggle. An umbrella policy could make up the difference. In other words, you wouldn’t have to empty your bank accounts, liquidate assets and sacrifice your retirement savings to make things right. Saving for retirement is essential, and protecting your savings is just as important. 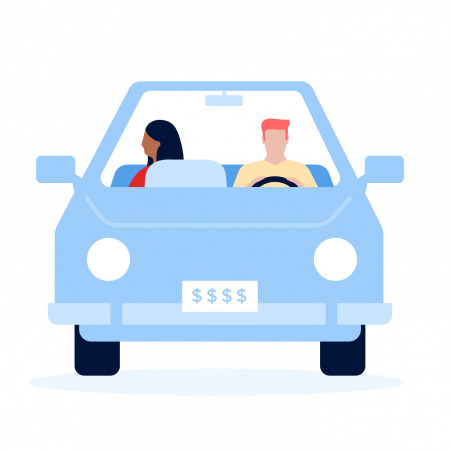 NerdWallet’s car insurance comparison tool can help you compare prices. Donna Freedman is a writer at NerdWallet, a personal finance website.